I think it's funny Nick's old signatures were USA Custom shops. HIs PRS sigs are imports. What does that tell you. He hasn't been playing his actual signature guitar. 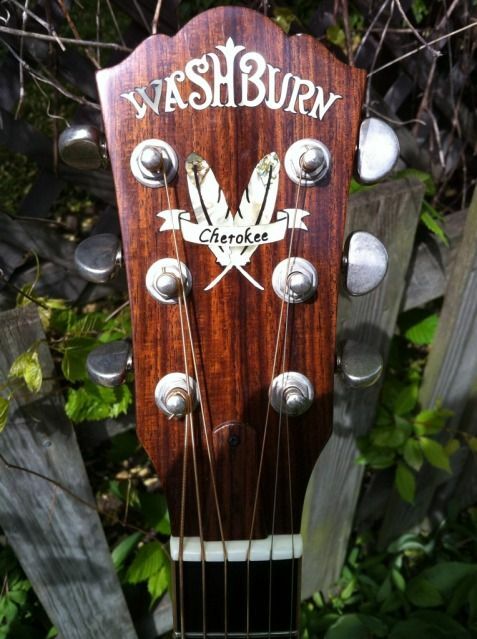 Washburn's marketing and artist roster needs help. They were on the right track with the actual construction and build of Nicks guitars but I didn't dig the big ET. Thick body deep carve LP killers though......awesome. Marketing fail. I knew it was washburns decision. Probably based on the fact that his guitars weren't selling. The reason to have a signature artist is so people will buy the guitar. Now, how much of the lack of sales of Nicks guitar was his fault for not stepping out and doing clinics and such, and how much was Washburns overall marketing which we all know is LAME is debateable. All I'm saying is His USA guitars were very very high quality USA custom shop guitars. Washy should produce the same guitar without the big ugly ET. and market it as something else. Washy should produce the same guitar without the big ugly ET. and market it as something else. Sweet blackburst ET Idol, no logo. I mean one that isn't a signature model.....those were special orders for BSG not production runs. there are two No Logo ET's on there , the second of which is a Nick Catanese no logo USA Custom Build. Is that not what you're talking about? This No Logo ET is still an ET and was probably too little too late for getting this guitar out to the masses who weren't BLS fans only. It was a great idea to get this guitar to reach beyond the very small niche of BLS fans. I have a USA Pilson that has the thickness, but not the pronounced carve. and dot inlays aren't that cool imo. I'm talking about Washburn building a guitar with those specs...thick body, deep carve,no ET anywhere. No association with an artist at all. I agree, but I doubt it'll happen. When I got offered a great deal on a USA Idol here in the UK all the Nick Catanese associated stuff put me right off. I probably wouldn't have bought it whatever, but I definitely wasn't going to buy a guitar heavily 'branded' for an artist I have zero interest in. I have a KH-502, which is only really an 'artist' guitar because of the skull and crossbones fretboard inlays. Without these it could be any old superstrat. The skull and crossbones is also a pretty generic image, even if sticking it on a fretboard does associate it with Hammett. WTF is ExTx all about? The artist guitar is a double edged sword. I sought out the KH-502 because whatever their faults I'm an old Metallica fan. However I wouldn't have bought it if it was overly 'branded'. I probably wouldn't buy a Ouija even if one came up really cheap. This is also why I have an NX3 rather than one of the 'import' Nunos, there is just too much artist association for me.